Shortly after we added the darker plank wall to the living room, I started craving something lighter on the floor. Although we still really LOVE our indigo Baxter rug, we rolled it up and put it in storage for now (maybe it will be a fall/winter thing? We’ll see.) and unrolled this beautiful, moroccan-inspired, budget-friendly rug out. You can a lot of different places, but we ordered the 10×14 size right here. For the price, we are all beyond impressed with the quality. It feels soft and cushy underfoot–soft enough to for the kids to roll around and play on–even though it’s a synthetic material. We’re using a standard waffle-like rug pad underneath (the same one we had before), but if you wanted even more cushion, you could definitely add a rug pad designed to do so. We also did a little rearranging. We moved the full-length mirror that has bounced between our bedroom and the entry in here for now to balance out how the left side of the wall is much longer than the right. Because you can’t step back too far in the entry, and see your full body, the mirror makes so much sense here anyway. I love how it bounces light and reflection around and makes the whole room feel larger, taller and airier. Someone on Instagram asked if we plan on adding any contrast to the room. Looking toward the couch (which is the photo I posted over there on Friday), I can see why that question would come up. The rug, sofa and wall color are all very similar tones. However, when you’re in the room, it’s anything but one note. 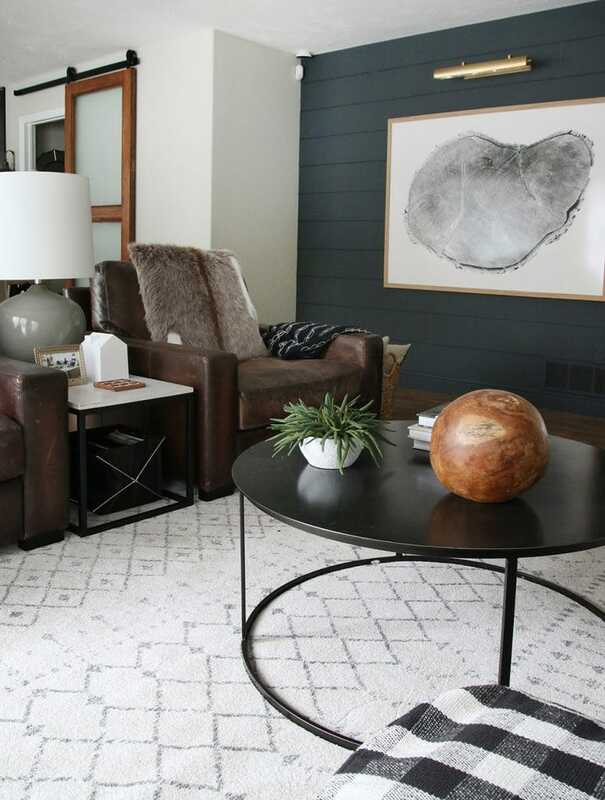 Opposite the couch, we have our two large dark leather chairs and you can see that dark paneled wall come into play, too. (The art print can be found here.) It feels a lot more balanced now, and it’s nice to have a place for eyes to rest, too. One, not so obvious, update we made was connecting all the lamps! 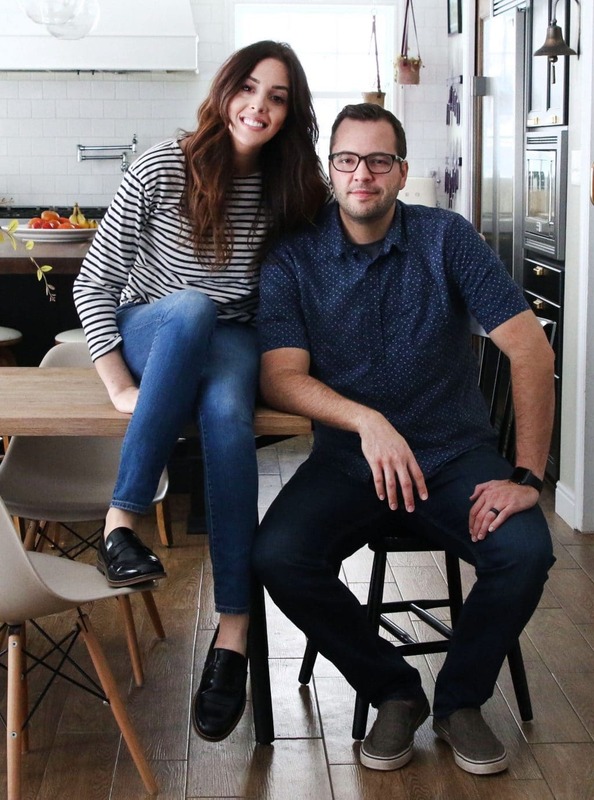 There’s no overhead light in the living room area, so before, we would have to manually turn on all the lamps, and worse–before bed, turn them off. Typing that out sounds so ridiculous, because it really isn’t that big of a deal. Although it was a simple task, it was one of those annoying things. Last week, Chris connected all of the lamps so we could turn them all on and off with the click of one button that lives under the end table nearest to the door. First, he snipped a small hole in the rug under one of the leather chairs so that we could feed that lamps plug to the other side of the room (We don’t have any floor plugs, and although we have wall plugs on this side of the room, we thought it best if all the lighting plugged in behind the sofa so there weren’t any rogue cords). We actually did this with our last rug, too. Cutting a hole in an area rug feels scary and wrong, but sometimes it’s necessary and it’s okay–great even if it means the room looks less riddled with cords and all the lights can be on one switch! I was surprised when we rolled up the blue rug, you couldn’t even tell where the snip was! We purchased one of these flat extension cords and taped it along the edge of the rug so it’s undetectable walking over it. You’re definitely going to want to get a flat cord though. Behind the couch, this extension cord picks up the arc lamp and both connect into another cord connected to the foot switch, where the third lamp plugs in, too. So when the time comes…. The whole thing makes me ridiculously happy. Our friends came over and complimented the new rug and I embarrassingly showed them the new lighting situation, too. I can’t help myself. It improved the quality of life we experience in here. Ha! So that’s how we breathed new life into our living room with minimal money and effort. Winter was long, dark and cold around here and it feels good to walk into something light and fresh these days. « Casual Friday + President’s Day Deals! Where did you get the shelf behind the couch? Where is the shelf from?! I am currently looking at this rug on sale at RugsUSA. I’ve never actually purchased a rug before and I’m a bit nervous about spending money on something I haven’t seen in person. 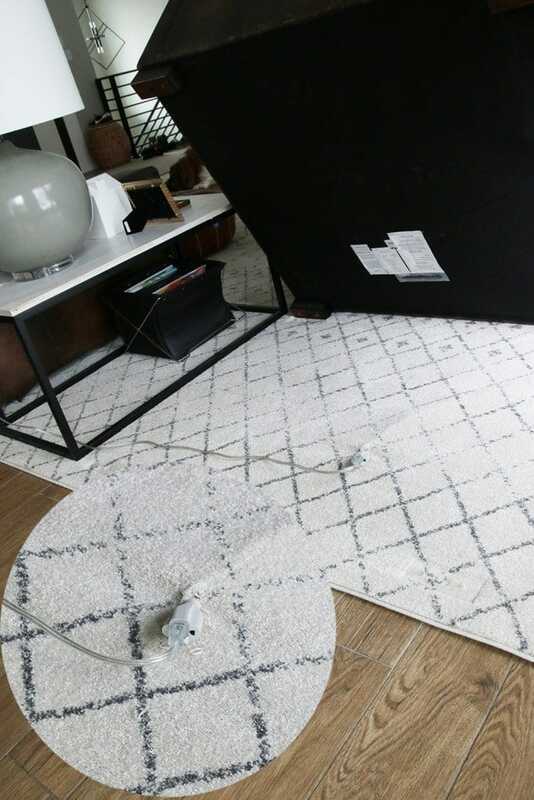 Plus my husband is hard to get on board with the whole rug period thing because he thinks they are all too expensive… Anyways I really like the look of this, but I’m a little worried about the lighter color. Would you say the rug has worn well in the year you’ve had it especially with kids and a dog? Have you had the opportunity (misfortune) to have to see how well a spill cleans up? I was looking at getting a wool rug because I know they should last better than man-made materials, but with the size I need for a living room I think my husband would die of sticker shock. And just wanted to add how much I love your blog and podcast. They bring me so much joy and you just seem like genuinely awesome people! So thanks for everything you do! It’s a great rug and has worn amazingly well. I actually like it better now a year later than the way it looked originally even! Love the shelf above couch. Could you provide details? How long is it? Where did you get your brown chairs? What is the style? Thank you! They are Pottery Barn Turner chairs, but we got them at an outlet! Hey! We’ve recently switched out our light rugs as they’re showing a bit of dirt from our golden retriever. How do you keep your light rugs clean with dog? Any tips or do you include the area rugs with your overall carpet cleaning? We’ve both had them cleaned as part of our carpet cleaning and also cleaned them ourselves using a pressure washer. The pressure washer is more work, obviously, but is a good option if professional cleaning is out of the budget. Though, if you don’t own a pressure washer, that’s not really in the budget either, in which case I would say renting a carpet shampooer from a local grocery store (most I’ve seen have them) is a good option, too. Can you let me know how the rug is holding up? I am about to order the same one for my formal living area. Thanks! It’s still looking awesome! Highly recommend it. What size rug is this one? Do you mind writing an update in a few months letting us know how the rug has held up? 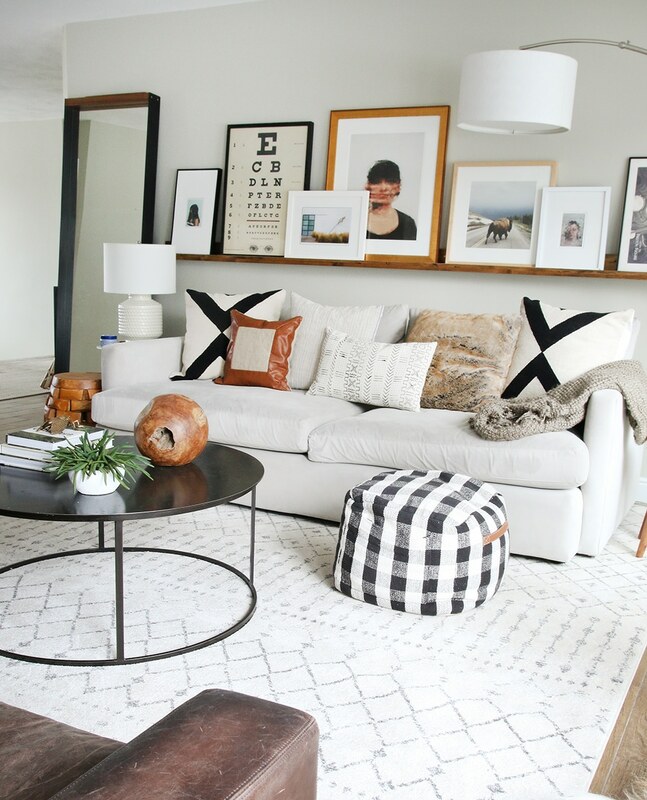 I wanted something similar so I bought the Kenya rug in cream from Target. But, within a few months, it is very matted and old looking. I’m already daydreaming about new rugs to buy. Yep – total fire hazard. I know because I got busted by a fireman. You need to invest in a CABLE PROTECTOR – about $25 on Amazon. This is a rubber channel specifically used for running electrical cables through areas were people walk to avoid trip hazards and to protect the electrical cables. I’ve been wondering about a source for the side table between the two leather chairs? I’ve tried the “shop our house” feature as well. Do you happen to know a source? I really like the dimensions of it! 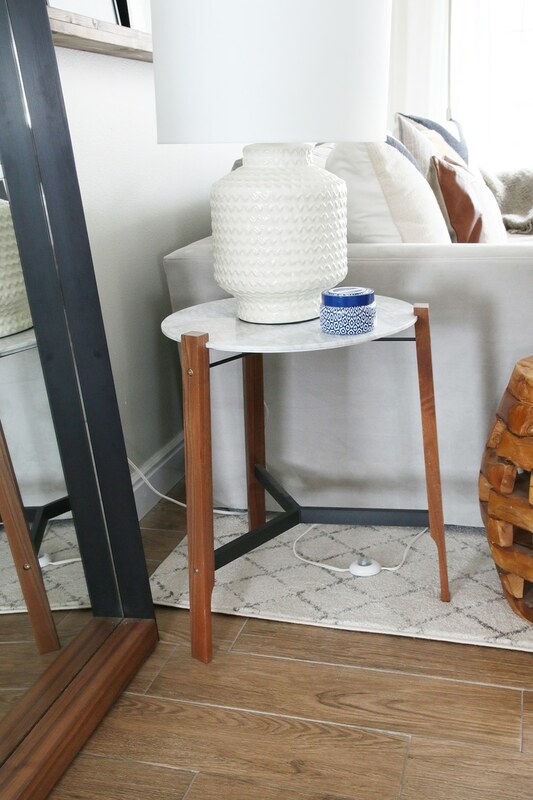 That’s an old small coffee table from Wayfair that we whitewashed ourselves many years ago. Check out this post for more details. Winters can get so long, can’t they. Glad you were able to breathe life into your main living space, now comes the home stretch ’till spring! We also don’t have any overhead lights in our living room. We got a echo dot with smart bulbs, so all the bulbs are networked together. Now we just Alexa lights on !!! It works really well. Love the new rug, I just might have followed the link and ordered one for our guest room. The price was just so good that I couldn’t help it – thanks for the share! Also, totally impressed by having the guts to put a hole in your rug, seems like it’s worth it to get those lamps lit with one switch! I love the tree ring print! I’m thinking it would look great in my kids’ room. What size is the one on your wall? We got the biggest size they offered and had it framed locally, since they don’t frame that big. I’ve always loved this room and love the new changes too! Did I miss the post on the lighting above the art on the plank wall? Love that! Thanks! You can see that post right here. I’ve been looking at this rug to help define different zones of our open concept floor plan. 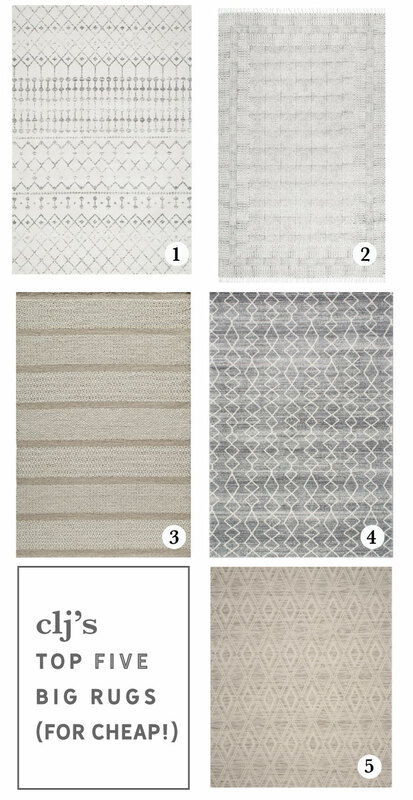 We already have a heathered wool rug that has a mixture of off white/creams and grays (West Elm Mid-Century Heathered Basketweave Wool Rug). 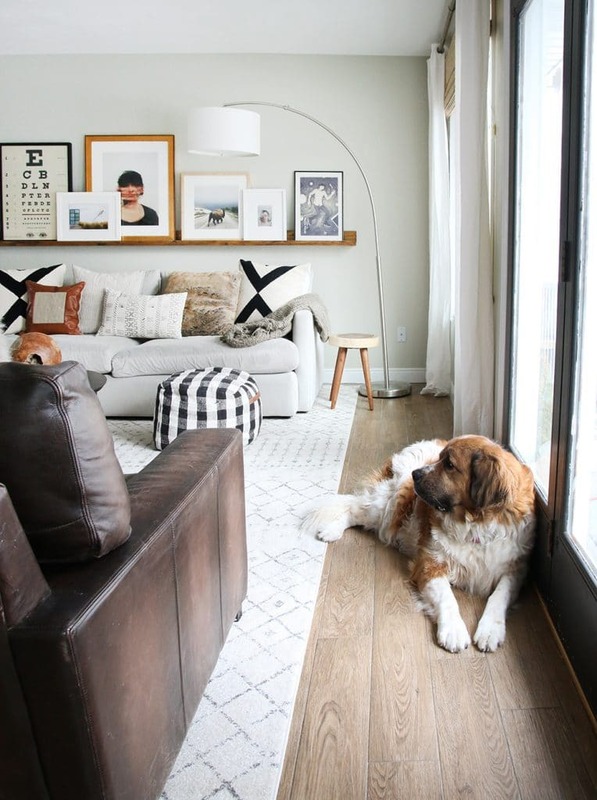 It’s hard to tell from the pictures on different websites how dark a cream color the rug is. I prefer a slight off white and want to avoid beige. How would you describe the color of it? Definitely not beige. It’s an off white, really light oatmeal color. Love this! We’re working on a living room refresh at the moment and I didn’t even think about how convenient having all the lights on one switch would be. Thanks! I love small changes, that might sound nit-picky, but make a huge difference in your daily life! Do you have a Tv in the room or do you need to go into basement to watch? No TV in here. We have one in our bedroom and downstairs. Just a word of warning, extension cords shouldn’t be run under rugs but if you do, check it regularly for signs of wear. 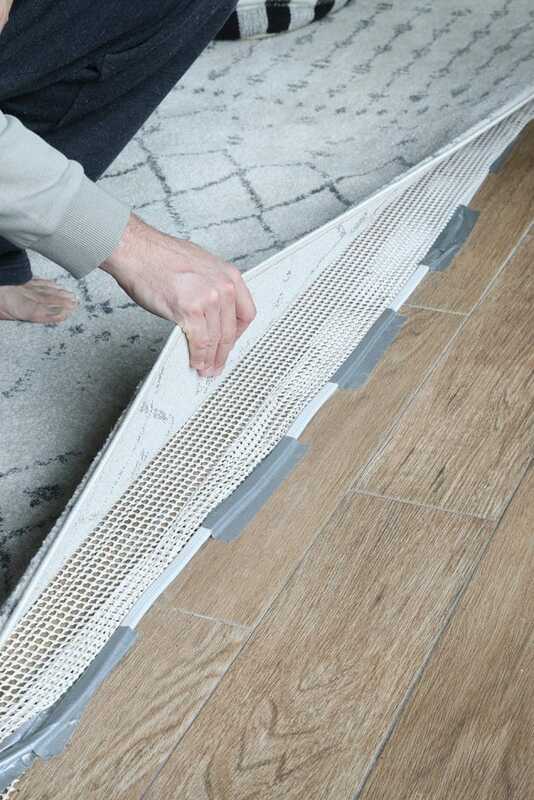 The friction from the rug can wear out the casing and expose the wires inside which increases fire danger. Good tip! We ran it at the very edge, on our lower traffic side, for that reason. A lot of the reviews the cord was used for the same purpose. Love that you can control all the lamps, and I don’t want to sound like a nag, but last I read it’s a fire hazard to run an extension cord under a rug. The heat can build up I guess and walking on the cord under the rug. Maybe you have a special cord, I don’t know, but it’s something to consider. Absolutely invite Alexa to that party! I use WeMo in my house, but there are a ton of options now. There is NOTHING so fantastic as being able to turn your lights on and off with your voice. I still giggle every time. Hahaha, I probably sound like such a grandma with my push button switch. Oh girl, you need SmartThings, stat! And the Amazon, Alexa, too. We have SmartThings hooked up to Alexa and at night we tell Alexa to “Turn on Night” and that one command turns off the TV and all the living room lights, as well as turns on our bedroom lamps on dim. It is so awesome! The rug looks beautiful too! I love the lighter look! I have been scheming to lighten up my living room since I saw yours on instagram. Oh I totally understand the lighting situation. We have no overhead lighting in our downstairs level, and it’s the most annoying thing to go around turning off each individual lamp at the end of the day. Like you said, not the end of the world, but having them all connected makes a huge difference–especially when you understand how many light sources you have to have to make a space actually feel lit up with no overhead lighting. Thankfully many of our rooms’ outlets are connected to a light switch, but a few of our outlets aren’t done this way. This year after Christmas, I plugged in all of our Christmas light timers to those lamps. I typically only need the lights on between 5-10pm–so now they come on and off like clockwork! Definitely makes me smile at the end of the day to have them all click off on their own. I love it Julia! 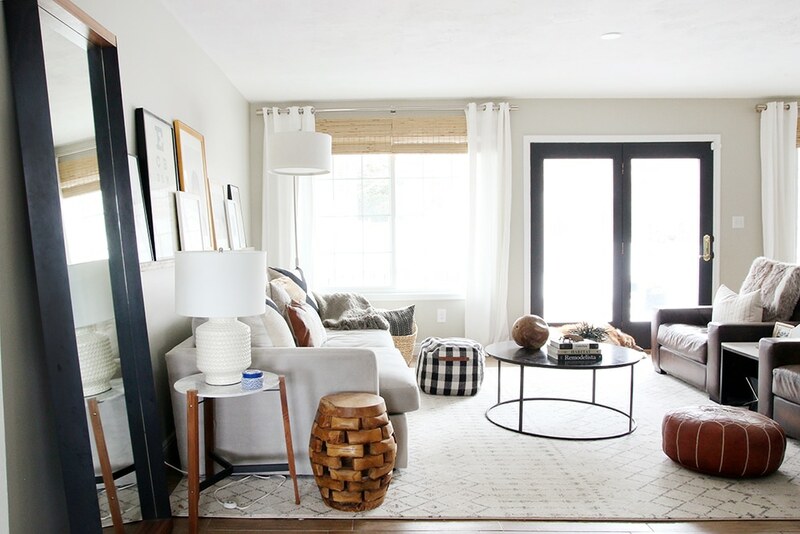 The new rug is such a bright and airy refresh for spring! Looks so good! 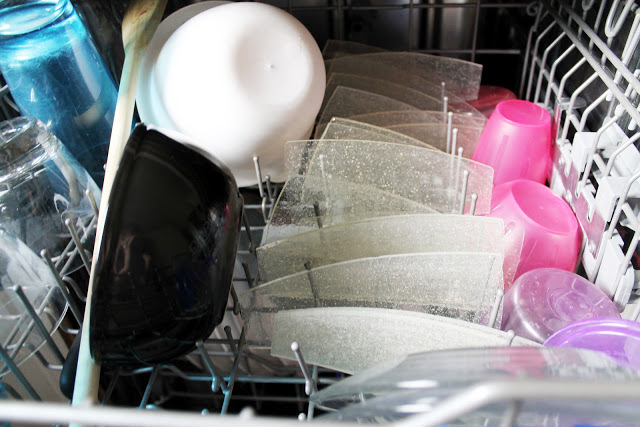 And I’m totally a fan of using mirrors to bounce around natural light – such a good trick! Where did the black pottery barn cabinet go? The mirror has replaced it there so I’m curious if it found a happy home in another spot or if it’s in storage for now. It’s in the entry! It’s a little deep for the spot, but it’s nice to have a landing spot when we walk in too.